Following the monochrome elegance of stainless steel, a new colourfulness is pervading the urban panorama. Architecture is becoming more multicoloured, enriched by an exciting interplay of design vocabulary and colour. Colour touches people, creates moods and gets people thinking about these sentiments. In the commercial construction sector, too, designers are making increased use of colour to bring articulation and structure to the characters of large buildings, which, for functional and economic reasons, are usually very much of a muchness. Colour gives them unique identities and, with sophisticated concepts, integrates them harmoniously into their surroundings. A good two years ago, GKD began continuous research and development into the colouring of meshes on the basis of its spiral mesh type Escale. 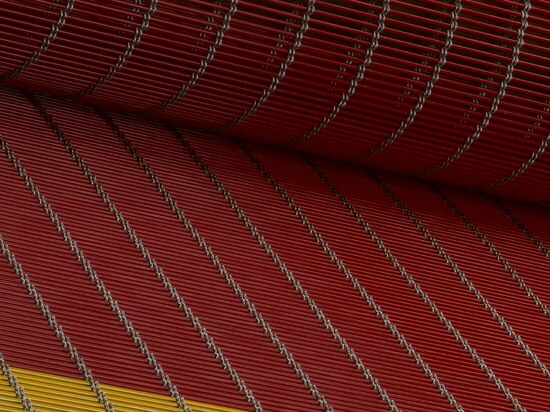 In collaboration with a band coating specialist with a reputation for innovative solutions, the technical weaver developed a process for brilliant, UV- and weather-resistant coating of flat wire. 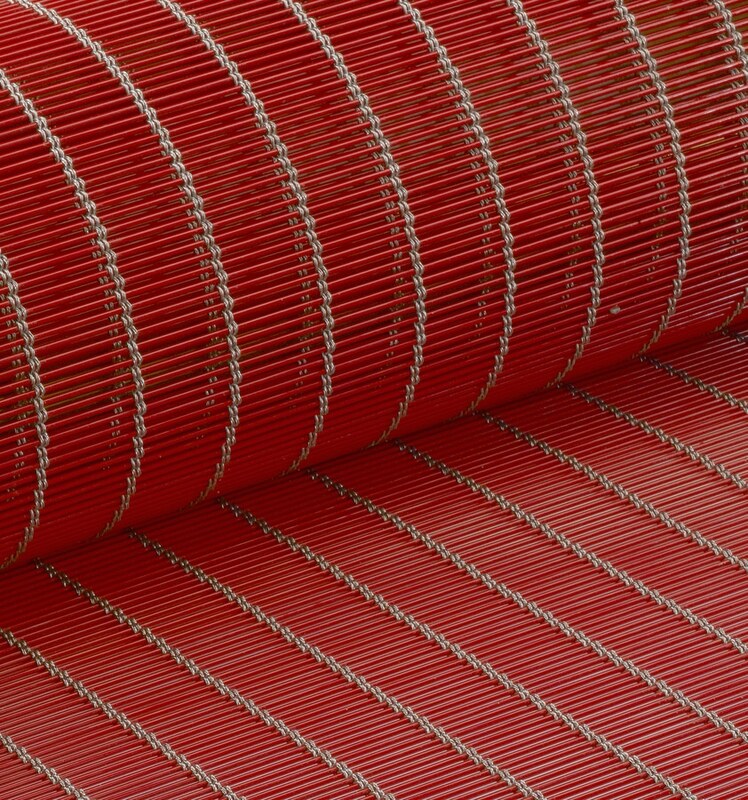 The highly resistant coating is applied in a continuous process and configured exactly to the further processing of the coated wire in winding machines and looms. In the continuous process, the approx. 15µm thick, high-quality coating and a special silk-gloss lacquer are applied to the stainless steel wire and firmly heat-set. While the baths used for anodising put limits on the dimensions in which mesh can be produced, in this continuous process several 1000 meters of wire per coil can be permanently colour-coated in any quantity required. This means that the capacities of GKD's looms to weave mesh in widths of up to 8 meters and in practically unlimited lengths can be exploited to the full. Demanding tests have verified the robustness of the spiral mesh coated by means of this process. UV-resistance was tested according to the Heraeus Suntest CPS. After 620 hours of radiation, the mesh showed no signs of discolouration or changes to its gloss level. It also got top marks in the salt spray test, in which the mesh is cut vertically and suspended at 35°in a salt spray chamber with 5% NaCL in H20. The coated Escale mesh showed no evidence of infiltration, peeling or yielding. Similar results are given in a test report on gold-coloured coated Escale that had been exposed to weathering for two years. In all categories – condensation, salt spray, artificial global weathering, natural weathering – the coated sample continuously achieved the highest ratings, even after 24 months, and showed no signs of deterioration compared to the reference sample. Further developing this process, GKD can now also offer coated round wires ranging in diameter from 0,5 mm to 3 mm. This means that from now on the popular GKD mesh types Lamelle, Lago, Kiwi, Omega, Baltic, Ocean, Tigris and Sambesi can also be produced in all RAL colours. 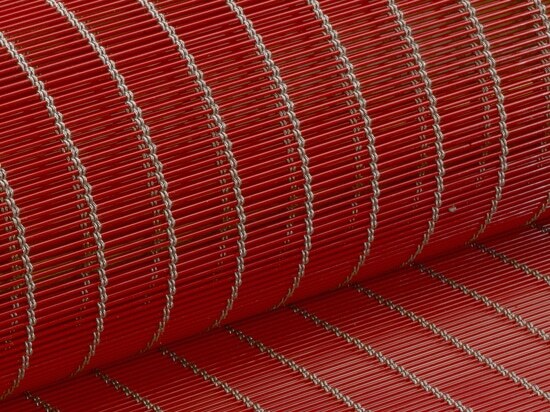 After coating, the round wires go through a highly demanding forming process in the weaving mill. Straightening, crimping and the weaving process itself all exert extreme strain on the robustness and durability of the coating. The specific chemical composition of the coating ensures that it bonds extremely well with the stainless steel and that the coloured wire remains undamaged while it is being processed into the new coloured meshes. Environmentally friendly because it is coated industrially and with practically no residues, and free from hazardous substances in compliance with the RoHS Directive, coated cable meshes bring a splash of colour into everyday architecture. GKD will be offering six trendy colours as future standards. Apart from black and white, meshes in blue, red, green and gold promise to add new dynamism to contemporary architecture. For larger orders, any other RAL colour can also be accomplished on request. Subtle accents are set with the uncoated, silvery cables that run vertically through the coloured mesh as filigree strands and reflect the light diffusely. Modern architecture lives from the skilful combination of form and function. 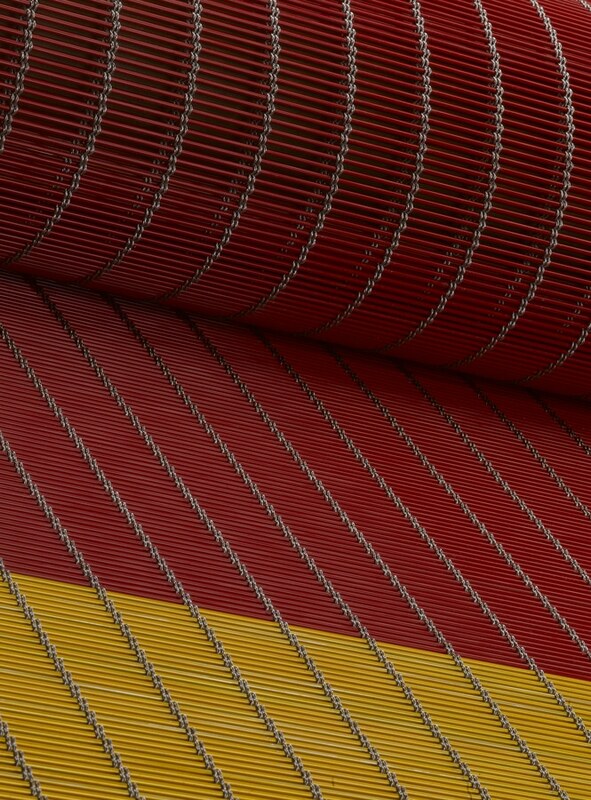 Reliable consistency of colour, high mechanical and chemical stability and resistance to the effects of weather make coloured woven metallic architectural and design fabrics of round or flat wires a trend-setting alternative in the construction sector.